Driven to absorb the many facets of how things work, how people work together, how to excel at what I do, and to make what I do a positive force in the world, I bring focus, innovation, and determination to my projects. I am naturally curious and not happy unless I am learning. I am not an expert at everything - who could be - but if you want me to become an expert at something, set it before me and I will dive in. 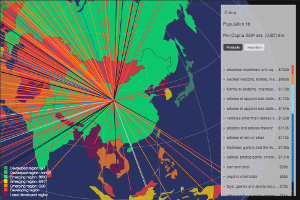 To explore and refine data visualization, I undertook a side-project that displays public global trade data provided by the WTO (World Trade Organization). The visualization is powered by D3.js with trade data and geography stored in a PostgreSQL database with a GIS extension for querying of geographic data. A simple static site built with Hugo (same tool as this site) that showcases a Denver area folk-rock band in which I sing and play mandolin, banjo, and fiddle.